I have lived in Dublin since 2000 and watched with bemusement as the city got swallowed up by a property boom. The city expanded in every direction in a haze of badly conceived, disposable constructions. The Liffey seemed the last vestige of 'old' Dublin. The urge to own property is an innately Irish sensibility due to colonisation and diaspora, it's the national obsession. 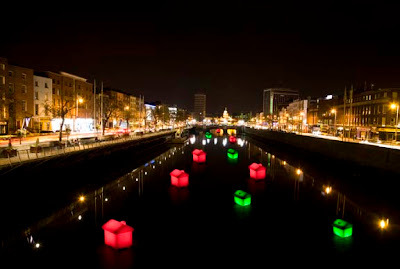 I hope to present an installation in 2010 compromising several, supersized red and green houses, floating in the river Liffey.